Vietnam Veterans Memorial is Finished! Vietnam veterans from throughout the area gathered together on Tuesday, March 1, 2016, to witness the installation of an authentic Vietnam-era Huey Helicopter at Veterans Park in East Las Cruces. As the centerpiece of the Vietnam War Memorial Monument, the 4,000-pound helicopter was lifted in place by two cranes that placed it on top of a 25-foot pillar. The vintage Huey was taken from the nearby War Eagles Air Museum in Santa Teresa and transported to Las Cruces on a large flatbed trailer. The monument is the brainchild of local community leader J. Joe Martinez, who spent nine years developing the monument and raising funds from the private and public sector for the project. 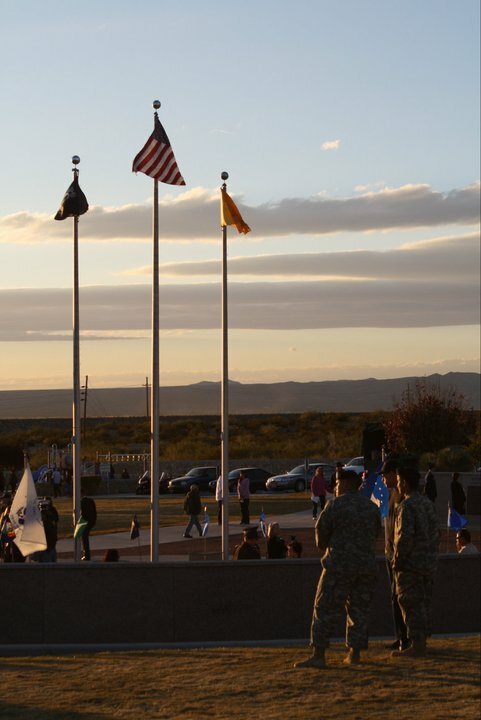 The New Mexico Vietnam Veterans War Memorial Project in Las Cruces, New Mexico, is a partnership between the community, the private sector, and the State of New Mexico to fund and build a memorial to pay tribute the 398 New Mexico Vietnam veterans killed in action (1955-1975). The memorial, titled “Heroes Never Thanked,” also honors all Vietnam veterans who served in Southeast Asia and those who have made the ultimate sacrifice by giving their lives during the Vietnam War. The New Mexico Vietnam Veterans War Memorial will reside in the Las Cruces Veterans Park. Each Killed in Action Vietnam Veteran from New Mexico will have their photo metal engraved and set in a semi-circular stone wall as part of the memorial.